Apple today introduced the new iPad, the third generation of its category defining mobile device, featuring a stunning new Retina™ display, Apple’s new A5X chip with quad-core graphics and a 5 megapixel iSight camera with advanced optics for capturing amazing photos and 1080p HD video. iPad with Wi-Fi + 4G connects to fast networks worldwide, including AT&T’s and Verizon’s 4G LTE networks, and still delivers the same all-day 10 hour battery life while remaining amazingly thin and light. 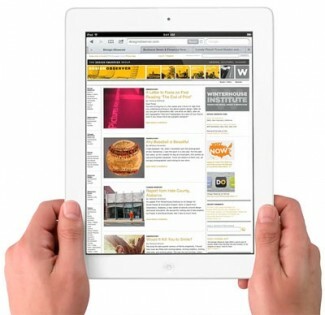 Beginning today, iPad 2 will be offered at an even more affordable price starting at just $399. iPad runs almost all of the over 585,000 apps available on the App Store™, including more than 200,000 native iPad apps, from a wide range of categories, including books, games, business, news, sports, health, reference and travel. The iTunes Store puts the world’s most popular online music, TV and movie store at your fingertips with a catalog of over 20 million songs, over 90,000 TV episodes and over 15,000 movies. The new iBooks 2 app for iPad lets users experience an entirely new kind of ebook that’s dynamic, engaging and truly interactive. iBooks created with Apple’s new iBooks Author offer gorgeous, fullscreen ebooks with interactive animations, diagrams, photos, videos, unrivaled navigation and much more. The new iPad Wi-Fi models will be available in black or white on Friday, March 16 for a suggested retail price of $499 (US) for the 16GB model, $599 (US) for the 32GB model and $699 (US) for the 64GB model. iPad Wi-Fi + 4G for either AT&T or Verizon will be available for a suggested retail price of $629 (US) for the 16GB model, $729 (US) for the 32GB model and $829 (US) for the 64GB model. iPad will be sold in the US through the Apple Store (www.apple.com), Apple’s retail stores, and select Apple Authorized Resellers. iPad will also be available in Australia, Canada, France, Germany, Hong Kong, Japan, Puerto Rico, Singapore, Switzerland, UK and the US Virgin Islands on Friday, March 16. Customers can begin pre-ordering their new iPad today, and the incredible iPad 2 is now offered at a more affordable price of $399 (US) for the 16GB Wi-Fi model and just $529 (US) for the 16GB Wi-Fi + 3G model.